It seems that I can’t get to the halfway point in July before I’m trying a new banana bread recipe. I feel like this happens, without fail, every single year. My grandma’s banana nut bread will always be the nearest and dearest to my heart, but that has never stopped me from experimenting. 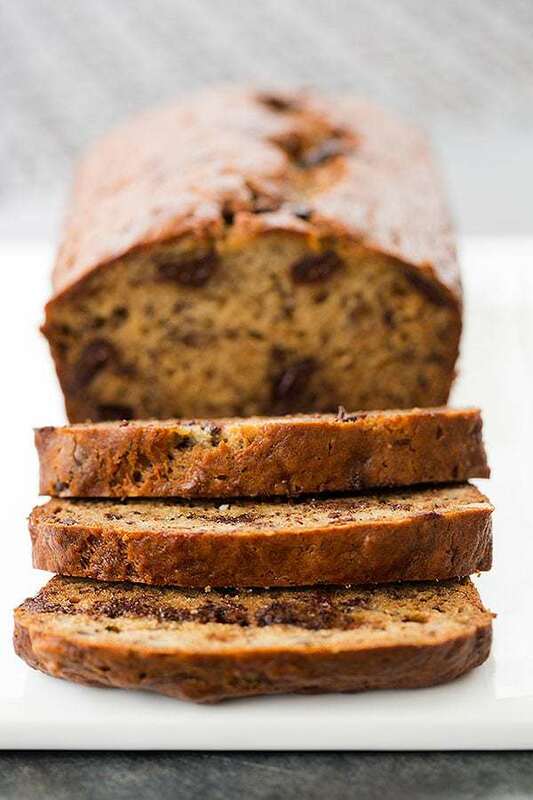 Over the years, I’ve made a black and white banana loaf, bananas foster banana bread, peanut butter-chocolate chip banana bread, zucchini-banana bread, ultimate banana bread, and yet, I still can’t pass up a banana bread recipe when I see one. It’s the same weakness I have for chocolate chip cookie or brownie recipes. Even though I have tried and true favorites, I just HAVE to try that new one I find. So, when I saw a recipe for banana bread with not just walnuts, but chunks of dark chocolate, there was no question that I needed to make it. I just so happened to have three bananas sitting on my counter that were starting to look rather pathetic, so I quickly mashed them up, grabbed some dark chocolate chunks and walnuts from the pantry, and I was in business. The original recipe calls for making this bread using an electric mixer, but I’m a firm believer that things like quick breads, muffins and brownies should be able to be made with a bowl, a whisk and a spatula… no special equipment necessary. So, I went ahead and did just that, and I don’t think it had any negative effects on the recipe whatsoever, especially since it called for mixing on low the entire time. 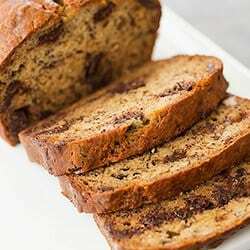 The dark chocolate cuts the sweetness of the bananas and the walnuts give the bread a toasty crunch… a perfect combination of flavors and textures. 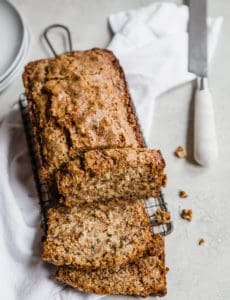 Add this to my ever-growing list of banana bread recipes that I’ve made and loved… on to the next! 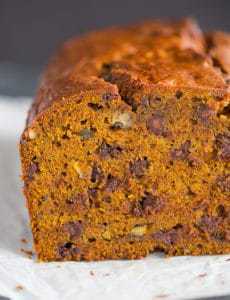 A fantastic banana bread with chunks of walnuts and dark chocolate. Preheat oven to 350 degrees F. Grease and flour an 8½x4½-inch loaf pan. In a small bowl, toss the chocolate chunks and walnuts with 2 tablespoons of the all-purpose flour. In a medium bowl, sift together the remaining flour with the baking soda, then stir in the salt. In a large bowl, whisk together the mashed banana, oil, sugar, egg and sour cream until completely smooth. Add the dry ingredients and stir until just combined. Fold in the chocolate chunks and walnuts until evenly distributed. Transfer the batter to the prepared pan and bake until dark brown and a toothpick inserted in the center comes out with a few moist crumbs attached, 60 to 75 minutes. Place the pan on a wire rack and cool for 15 minutes, then turn the bread out of the pan and allow to cool to warm room temperature before serving. The bread can be stored, wrapped tightly in plastic wrap at room temperature, for up to 5 days. This bread can also be frozen (wrapped in plastic wrap and placed in a freezer ziploc bag) for up to 2 months. Love this recipe! It is delicious and so easy to make. 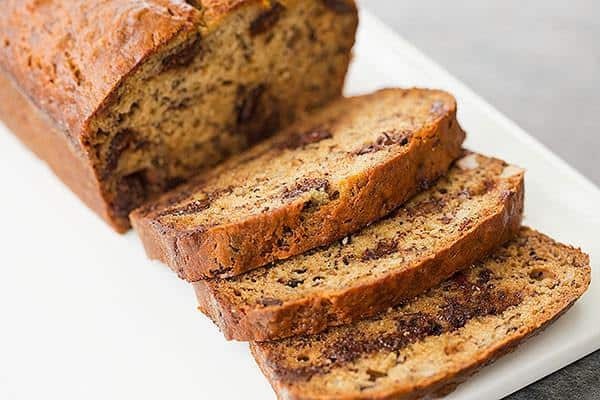 The walnuts and chocolate chunks take banana bread to a new level! These sound so delicious. Thaanks for sharing this recipe. How do you think it would be without walnuts or any nuts? Hi Alice, I think it would be just fine. Would it be good if I substituted the sour cream with greek yoghurt? It is healthier, and I don’t have sour cream on hand. Hi Nicole, Yes, that substitution should work just fine. Love your site. Had some ripe bananas and decided to try this recipe. All I can say is “delicious”. Easy to put together and tastes amazing. I did not add the walnuts cause of a nut allergy and added sunflower seeds instead. Doubled the recipe also. This recipe is a definite keeper. I love making things by hand and banana bread is the perfect recipe to make! 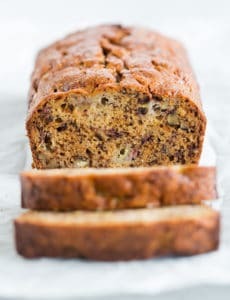 This looks amazing and I’ve had a banana bread craving. I just made this last weekend and it turned out great! I love banana bread AND dark chocolate and the combination was perfect together. I will have to add it my ever growing list of banana breads too! Thank you for listing the measurement for bananas, not just how many! They vary in size so much that I’ve found just going by a certain number can make a bread too moist or too dry depending on the size of the banana. Well, this is serendipity! 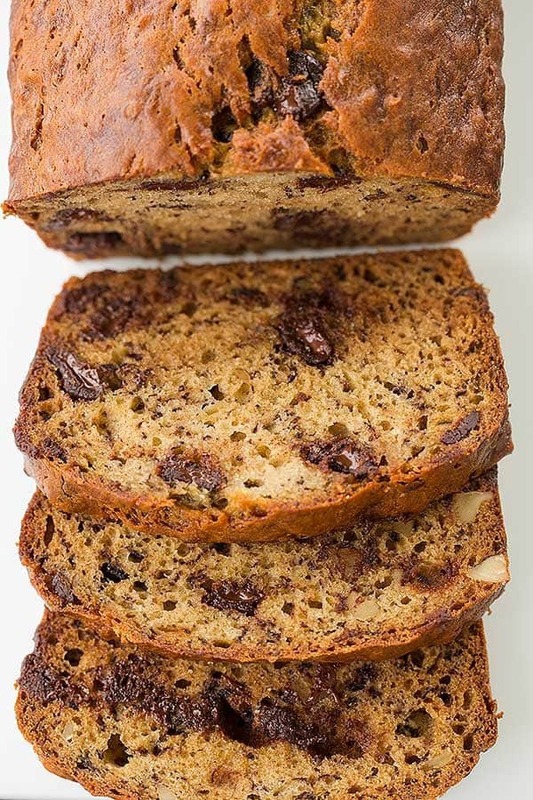 I have never made banana bread before, but was just looking at 6 past their prime bananas on the counter and thought “I should look for a banana bread recipe that has lots of walnuts, and maybe I could add some chocolate chips.” Opened my e-mail, and there it was! Thank you. We are going to see “The Minions” tonight so this is perfect. BA NA NA! I’m always trying new recipes too, even if I have favorites. I just recently discovered that I actually like banana bread, so I will definitely be making your recipe. By the way, your ingredient list has 1/4 sour cream…I’m assuming it should be 1/4 cup sour cream. Is that correct? And could I substitute melted butter for the oil? Thanks Michelle! !